Nomad is one of the latest companies to be formed off the back of a successful Kickstarter project. They began in 2012 with ChargeCard, a credit card sized Lightning and microUSB charger designed to be kept in your wallet at all times. It was a modest success, reaching its target of $50,000 and continuing on to raise $161,897 in total. A year later, the company soon produced a second design, the ChargeKey, which solved the same problem but in a smaller key-shaped space. This was offered for crowd-funding on Indiegogo, where it raised $172,274 of its $50,000 goal. Another year later, and Nomad have offered both gadgets for me to review. As you may have guessed from the title of this page I accepted that offer. I’m intrigued to see how the ChargeCard and ChargeKey hold up, so let’s begin. Nomad offer both Lightning and microUSB flavours of both gadgets; I took the microUSB version. This is the only substantive difference between them, so you can mentally replace ‘microUSB’ with ‘Lightning’ pretty much anywhere in this review. The ChargeCard is the larger of the two, the size but not the shape of a credit card. It’s predominantly constructed with ABS plastic in a rectangular shape with one corner cut off to allow for the microUSB connector to sit within its bounds. A rubbery strip of USB cable sits within the card, and is made of a flexible thermoplastic. This can be pushed out one side or the other to allow a bit of distance between laptop and phone – although to reach its maximum length, you’ll need to fold the rubber strip about 180 degrees back and away from the plastic card. 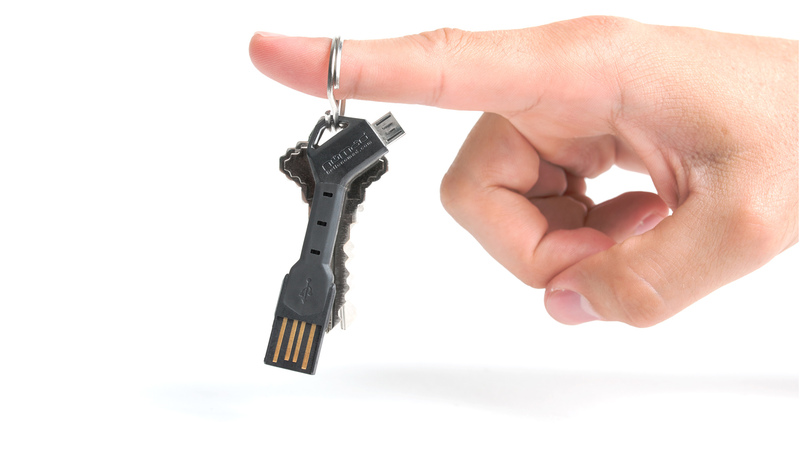 The ChargeKey seems far more convenient, a key-sized rubbery strip with microUSB at one end and full-size USB at another. The bulk of the ChargeKey is made from a flexible thermoplastic, while the rest is made of polycarbonate. The only design flourish is a small loop at the top to allow the key to be attached to a keyring. Both are reasonable designs, but could stand improvement. The ChargeKey is the better option in terms of portability, but the microUSB and USB connectors seem vulnerable. The ChargeCard is a better design for protecting the USB end, but the microUSB connector remains somewhat exposed. The ChargeCard also seems to have a lot of wasted space; it doesn’t seem hard to imagine a better design that utilises more of its inner area to make for a longer overall maximum length. Indeed, soon after writing this review, Nomad announced a new revision of both the ChargeCard and ChargeKey, fixing many of these issues. The new NomadCard has two moving strips in the centre to better use the space (and to make for an entirely straight periphery), while the NomadKey has a standard metal sheath for the USB connector. Both items, along with a third entry, the NomadClip, are set to debut this autumn. 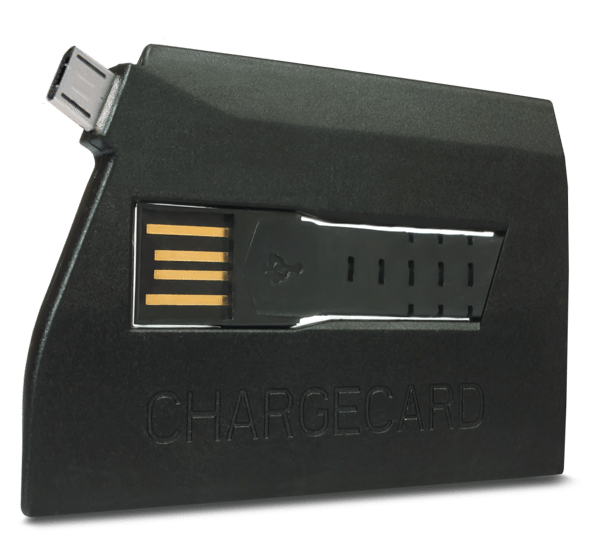 I used the ChargeKey and ChargeCard wherever possible for a two week period, both at home (even if it wasn’t strictly necessary) and on the road (at the office, on the train and in hotels). Both ChargeKey and ChargeCard suffered from one minor concern – they often left my phone in a rather precarious position. Charging from a laptop was fine if I had enough desk space, but many times I had a phone hanging from a USB port. Wall chargers were worse, often leaving my phone hanging at a convenient kicking height. While I only suffered minor incidents where a friend or colleague blundered into these hanging contraptions, it was still an issue that is part and parcel of using what is in effect a much shorter cable. Despite my forgivings about the devices’ durabiity, they survived the two week period without showing signs of wear or damage, even with considerable flexing of the rubbery strips of both devices and the aforementioned blunders. Overall though, both ChargeKey and ChargeCard performed in their roles admirably. I found the diminutive ChargeKey’s greater space saving more handy than the extra length of the ChargeCard, but both were viable options on the road. It was great to forgo packing the usual tangle of microUSB cables, and made for a much less messy gadget bag. The question is: Are the ChargeKey and ChargeCard worth the money? At $30, you could get one ChargeKey or ChargeCard, or five or six microUSB cables – just leave one at each place you are likely to be, and maybe you don’t need a cable to come with you. * But there’s always going to be a time where you’re traveling somewhere unexpected, and you just need to charge your phone – and this is the problem that ChargeCard and ChargeKey are designed to solve. Given this utility, and the fact that they can stand in for your normal microUSB cable, they become a much more tenable purchase. ChargeCard and ChargeKey are not essentials, but they are definitely nice-to-haves. *Lightning cables are more expensive, so this argument holds less weight for the Lightning variant of the ChargeKey and ChargeCard – here you’re not paying too much more for the convenience of portability.